It’s summer at our sub-tropical garden! Unlike places up north that doesn’t mean rows and rows of vegetables and mellow healthy sun. Instead, we have really hot humid veggie-wilting, bug-generating weather tough to work in even when it’s not pouring down rain! Never fear though, our fruit trees love these conditions! Visitors and volunteers alike have been sampling Tamarind pods, Barbados cherries, Bananas, Pineapples, Mangos, Mulberries, Passionfruit and Figs. Watermelons and Starfruit are almost ready for harvest. In addition we have gorgeous Swiss chard soldiering on like its Switzerland, a delicious, if unexpected, summer treat. 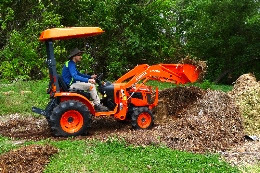 In our last email update you heard the news about the garden tractor, a bright orange Kubota machine we’ve named “Ferdinand”, after the classic Disney cartoon. Our Ferdinand likes to smell the flowers and sit in the shade of the fruit trees as well, but we are keeping him super busy, moving mulch and compost and prepping things for a big fall growing season. He’s a strong addition to our mega-team of volunteers. We have another very exciting announcement: Opening this fall is the Fruitful Kitchen, an outdoor flexible and accessible kitchen built right into the garden. You guys run a garden, why a kitchen? Enter an outdoor kitchen with teaching areas that invite participation by adults, children, and those with disabilities. Such a kitchen brings tomatoes, greens, herbs, and broccoli harvested literally “minutes ago” into a sizzling front-stage spotlight for cooking and sampling. It provides a space for getting confident with that ‘arroz-con-pollo-like-abuelita-always-made” or that Bean and Squash New Year stew you grew up with in Haiti. It also brings in a friendly ally to the busy mom trying desperately to get kids interested in vegetables that aren’t deep fried. In addition the shaded space will allow the Fruitful Field to cook workday volunteer lunches straight from the garden and Parkway Church to cook up tasty healthy meals for the working poor of the neighborhood in an environment that is pleasant and engaging. Thanks to the Gardening for Good Fund of the Community Foundation of Broward, the start up construction expenses of this kitchen have been funded and we have begun prepping the site with anchor points for counter tops and additional education space. Sinks, cabinets, electrical connections, and cooking necessities will come next. Donate: Equipment or Funds: When the kitchen is complete we will need to outfit it with things like heavy duty cookware, 2-3 portable induction burners, high-powered blenders for smoothies and soups and so forth. If you have these items in excellent condition to donate, or would like to contribute to their purchase, please email Flavio. Join us in bringing food, education, and community together in an outdoor kitchen!